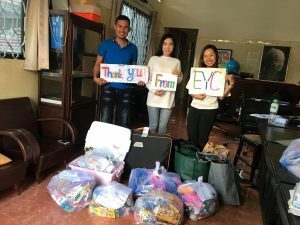 In 2015 Dr. Ben Carson, an English professor at Bridgewater State University (BSU) in Massachusetts, led his first group of students on a study tour to Cambodia where they volunteered and taught English at EYC. Dr. Carson became involved with EYC through Dr. Kevin Curry of BSU, and in part because of his connection to Synoeun Nov, a former EYC student, and current EYC Program Director, who attended BSU for a year. Dr. Carson now takes roughly ten students to Cambodia every year for a three-week visit, and I have been fortunate to participate in two of these trips. 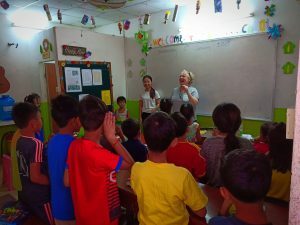 During our trip to Cambodia, we teach in EYC’s four schools for about 6-8 days. We develop lesson plans to help improve each student’s English language skills while also keeping the learning fun. In addition, we bring suitcases filled with school supplies, which we donate to the schools. While in the schools, we teach six one-hour classes a day, with a lunch break in between. We hop into Tuk-Tuks and head out to the schools at 7:30 am, teaching our first three classes between 8:00-11: 00 am before leaving for a lunch break. By 1:30 pm we are back in our Tuk-Tuks excited and ready to teach from 2:00-5: 00 pm. The EYC students we teach range in age from 5-21 and are separated into classes based on their ability. Sometimes we teach a class of 10 students followed by a class of 35 students. The large number of students can be overwhelming, but I think our time in the EYC classrooms makes us more courageous in our teaching. Also, the experience helps us learn to work with others and understand the power of communication and connection. Coming to EYC is not only about teaching but also about developing meaningful relationships with the students and teachers. We teach the kids, and even the teachers, new games and activities that make learning fun and engaging. We love doing arts and crafts, which help EYC students learn their colors and shapes, as well as playing different hand games. The hand games allow each student to learn through healthy competition. The outcomes of these approaches are very positive, and the teachers appreciate the role the BSU students can play in the classrooms. While in Cambodia, BSU students not only get to teach but also have the chance to explore Phnom Penh and learn the history of the country. By exploring the city, we get to see where the students we teach are from and how they live and thrive. Although EYC children come from very poor neighborhoods, they find hope at the EYC schools. A lot of the BSU students are shocked when they see the degree of poverty in the communities in which they are going to be teaching, but they are quick to feel at home in the communities. They are also surprised by how much the EYC students know and pick up on so quickly. For BSU students who are new to teaching, the experience with EYC is very rewarding as they can see how they can help and have a positive impact on their students, even if they are with them for only a short time. I made my second trip back to Cambodia this January with Dr. Carson’s BSU group. I reunited with the students from the year before at Aziza Thmey along with the teacher who inspired me to come back. During my first trip to Cambodia in January of 2018, I was able to learn a lot from the students. 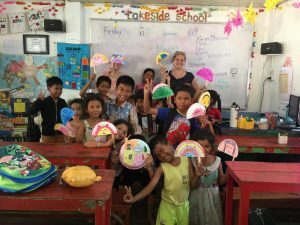 I learned that a language barrier does not hinder your ability to make a connection with other people, and I was able to form a strong bond with the teacher and students. 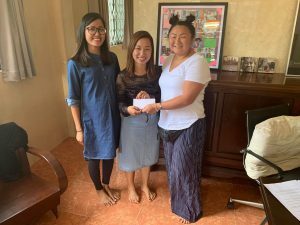 By coming to Cambodia and seeing where the students grow up, I learned to appreciate my own life more and realized how important it is to travel and experience new cultures. For me, it is crucial to come back every few years to let the students know that they mean something to me, and I don’t forget them when I leave. That being said, not everyone will have the chance to travel and volunteer like this, and I want people to know that one of the most important things Dr. Carson taught me was that you don’t have to fly halfway around the world to help, you can start small in your own town and help others. Every time I leave the students, I encourage them to stay in school because I know that without an education, their options will be very limited, and in some cases, dangerous. I hope that the EYC students take away new reading and speaking skills from our time in the classroom as well as fond memories of the BSU students making learning fun. EYC has a special place in my heart as well as the hearts of Dr. Carson and the other BSU students.